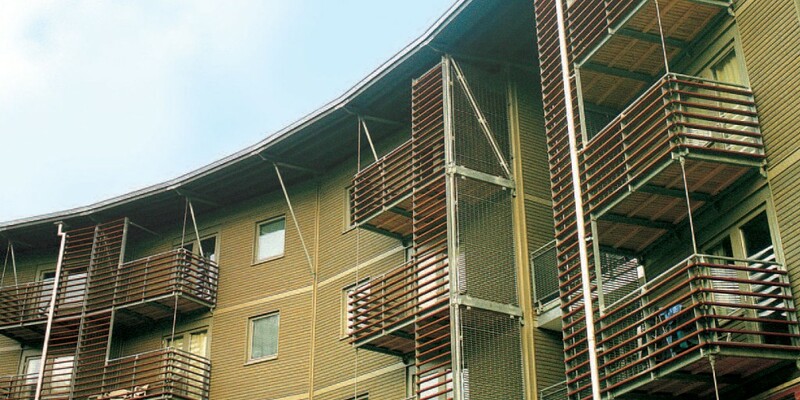 The impressive Caspar II project in Leeds, is a crescent shaped apartment block adjacent to Leeds’ busy ring road, and is the second development inaugurated by the Joseph Rowntree Foundation to provide city centre apartments for single people at affordable rents. The scheme is on the site of a car park which was constructed when the motorway was first built, and provides 45 two bedroom homes, designed by architects, Levitt Bernstein, following an unusual and striking design. The apartments themselves were constructed off site by Volumetric as single modules which were then transported to site. They were then clad with red and grey timber cladding and constructed together using industrial style steel balconies and walkways. For maximum protection and durability for the timber detailing, products from Sadolin’s Woodcare range were specified, with Classic used for the cladding, Superdec for the detailing under the roofs and Supercoat applied on the windows and doors. Sadolin Classic is an organic, solvent borne water repellent decorative wood protection, with a translucent finish that enhances the natural beauty of the underlying timber cladding. For protection, it provides a light fast pigmentation that is absorbed by the softwood surface, ensuring that it is weatherproof, resistant to peeling and flaking, and will not bleed or leach out. For the Caspar project, it was supplied in a contrasting Slate Grey and Red Pepper colour scheme. Sadolin Supercoat Exterior Woodstain is a high build moisture permeable woodstain with a high solid content that provides a long lasting protection with just one coat when compared to conventional translucent solvent or water borne coatings. Unique drying characteristics give extended open and drying times that offer improved application benefits to ensure a uniform finish, on this occasion in Slate Grey to complement the cladding.